A retrospective chart-based study of previous 2 years was done in a tertiary care hospital from September 2017. All babies born to young mothers (19–21 years) were taken as cases and babies born to mothers aged 22–30 years were taken as controls. Neonates born to mothers with chronic illnesses of lungs, kidney, and heart and with obstetric complications were excluded from the study. Controls were selected in the ratio 1:1 and the controls were the babies born to women between 22 and 30 years who delivered next as that of the cases delivered and by the same mode of delivery. Data were collected based on the inclusion and exclusion criteria which was done by going through the medical records of the mother/neonate admitted in our hospital. Following parameters such as gestational age, birth weight, small for gestational age, neonatal outcomes, APGAR score at 1 min and 5 min, ICU admissions, hypoglycemia, asphyxia, neonatal hyperbilirubinemia, sepsis, convulsion, stillbirth, and condition at discharge were compared to babies who were born to mothers aged 19–21 years and aged 22–30 years. Data were analyzed using frequency, percentage, and Chi-square test. A neonate whose birth weight is <10th percentile for Gestational age or <2 standard deviations below the mean for the infant's gestational age (World Health Organization charts). 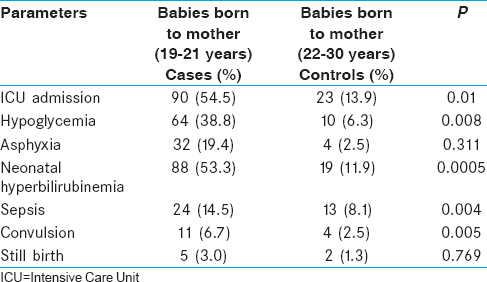 In our study, a total of 330 neonates were included, 165 cases and 165 controls, after which the results were obtained using parameters such as gestational age, birth weight, small for gestational age, APGAR score, hyperbilirubinemia, sepsis, asphyxia, convulsion, and stillbirth [Table 1], [Table 2], [Table 3], [Table 4]. In our study, it was found that sixty babies were born to young mothers in the range of 28–34 weeks as compared to 9 babies in the older mothers. Similar results were found in studies done by Yadav et al. and Kang et al.,, proving that young mothers had a higher incidence of preterm deliveries. It was found that 105 babies born to young mothers were low birth weight as compared to 36 babies in older mothers, implying that young maternal age leads to low birth weight babies. There was no difference found in both the groups in relation to Apgar Score at 1 and 5 min, whereas a study done by Sharma et al. showed low APGAR score (<7) at 1 min in babies born to young mothers as compared to older mothers. In our study, it was found that ninety newborns born to young mothers required NICU admission as compared to 23 babies in older mothers. Similar results were found in a study done by Ezegwui et al. Young mothers had a higher incidence of babies who were born preterm, low birth weight and in turn had higher chances of asphyxia, stillbirth, and late complications such as sepsis and hypoglycemia which required NICU admissions. In our study, neonates born to young mothers had a higher incidence of hypoglycemia, sepsis, neonatal hyperbilirubinemia, and convulsions as compared to older mothers. Incidence of asphyxia at birth in both the groups was insignificant. Whereas, in a study done by Chen et al., it has been reported that the incidence of asphyxia at birth was higher in babies born to young mothers. The strength of our study is that a large population was involved and it can be applied in the general population. The weakness of our study was that hypoglycemia, sepsis, and jaundice were the confounding factors and it was related more to gestational age of the baby rather than the mother's age. Young mothers had a higher incidence of having preterm babies, low birth weight babies with comorbidities, and NICU admissions as compared to older mothers. Fraser A, Brockert J, Ward R. Association of young maternal age with adverse reproductive outcomes. Stud Fam Plann 1995;26:186-9. Kurth F, Bélard S, Mombo-Ngoma G, Schuster K, Adegnika AA, Bouyou-Akotet MK, et al. Adolescence as risk factor for adverse pregnancy outcome in central Africa – A cross-sectional study. PLoS One 2010;5:e14367. Yadav S, Choudhary D, Narayan KC, Mandal RK, Sharma A, Chauhan SS, et al. Adverse reproductive outcomes associated with teenage pregnancy. Mcgill J Med 2008;11:141-4. Restrepo-Méndez MC, Barros AJ, Santos IS, Menezes AM, Matijasevich A, Barros FC, et al. Childbearing during adolescence and offspring mortality: Findings from three population-based cohorts in Southern Brazil. BMC Public Health 2011;11:781. Mukhopadhyay P, Chaudhuri RN, Paul B. Hospital-based perinatal outcomes and complications in teenage pregnancy in India. J Health Popul Nutr 2010;28:494-500.
International Institute for Population Sciences. National Family Health Surveys, India. Key Findings from NFHS-4. Mumbai: International Institute for Population Sciences; 2015. Available from: http://www.nfhsindia. [Last accessed on 2017 Oct 05]. Sharma V, Katz J, Mullany LC, Khatry SK, LeClerq SC, Shrestha SR, et al. Young maternal age and the risk of neonatal mortality in rural Nepal. Arch Pediatr Adolesc Med 2008;162:828-35. Malviya MK, Bhardwaj VK, Chansoria M, Khare S. Anthropometric profile and perinatal outcome of babies born to young women (<18 years). Indian Pediatr 2003;40:971-6. Eric C, Anne R, Camilia R, Ann R. A high risk newborn. Cloherty Starks Man Neonatal Care 2016;1:e79-80. Kang G, Lim JY, Kale AS, Lee LY. Adverse effects of young maternal age on neonatal outcomes. Singapore Med J 2015;56:157-63. Ezegwui HU, Ikeako LC, Ogbuefi F. Obstetric outcome of teenage pregnancies at a tertiary hospital in Enugu, Nigeria. Niger J Clin Pract 2012;15:147-50. Chen XK, Wen SW, Fleming N, Demissie K, Rhoads GG, Walker M, et al. Teenage pregnancy and adverse birth outcomes: A large population based retrospective cohort study. Int J Epidemiol 2007;36:368-73.